The author of this book “My Fortune”, Mr. V.S. Guruswamy is the son and disciple of the world-famous numerologist Pandit Sethuraman who revolutionized the field of predictive sciences by his extra-ordinary book “ADHISTA VINGYANAM” (Science of Fortune” in English) as early as 1954. Because of the pioneering efforts of Pandit the science of numerology not only flourished but also acquired a venerable status. There is not a single professional or a reader in this field, who did not take lessons from Pandit’s book to become successful in his life or career. 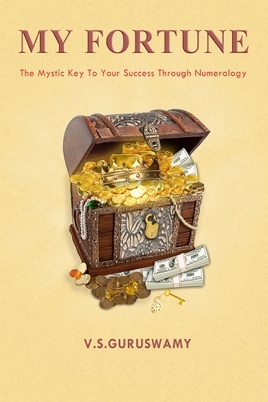 Mr. V.S.Guruswamy, the intelligent son and disciple of an illustrious father like Pandit Sethuraman, has two decades of successful practice as a professional numerologist and has published this valuable eBook, “My Fortune”, which comprises the formulae to overcome the day-to-day problems of human life with the help of favourable numbers. Positive numbers lead to success and negative numbers lead to distress. It may sound simple but it is the gist of Mr. V.S. Guruswamy’s thorough study and research under the guidance of his father and it is tailored to fulfil the aspirations of people from all walks of life! This book is basically a compendium of secrets about the dates of birth on which you were born, with related effects of your destiny number, how and to what extent you can progress in your life and what is needed to be done numerologically to choose a lucky name for a better future. The secret of success in life lies in choosing the right name with right numbers according to one's date of birth. This book unleashes the mysteries of the fate and the free will and helps you to succeed in life by making appropriate change in the spellings of your names. This valuable book serves you as a guide and companion throughout your life since the author's findings are based on decades of his research and experience. It is very difficult to attain success but very easy to lose. If you follow the concepts mentioned in this book, you can attain and also retain success. To anyone born from the 1st January to 31st December of any year "My Fortune" shows the nexus between them and success. Frantically searching for success in our professional and personal lives, we must consider ourselves fortunate in our quest, if we have this book, "My Fortune" which is the ultimate.